Roy Tyndal Ellis, 77, of Ocala, FL. (formerly of Kearney, MO), passed away April 26, 2018, at the UF Health Shands Hospital in Gainesville, FL. He was born June 4, 1940, in Windsor, Ontario, Canada, and moved with his family to Kearney in 1989. He and his wife Kathy moved to Ocala, FL in 2015. Roy was preceded in death by his parents, Clarence and Dorothy Jean (Elgie) Ellis; first wife, Carol (Hall) Ellis; and brother, Douglas Ellis. Roy began his Masonic life at Parthenon Lodge #267 AF & AM in Chatham, Ontario, and later became a member of Liberty Lodge #31 AF and AM in Liberty, MO. He was also a former member of Mocha Shrine and its Horse Patrol in Chatham and Ararat Shrine and its Mounted Guard in Kansas City. He was also a longtime member of Pleasant Valley Baptist Church in Liberty. Survivors include his wife, Kathy (Trotechaud) Ellis; sons, James Ellis (Jennifer) and Shawn Ellis; grandchildren, Lily, Samuel and Emma Ellis; sisters, Lynda Ellis (Denis Labute) and Susan Pugsley (James); as well as nieces, nephews, other family members and friends. 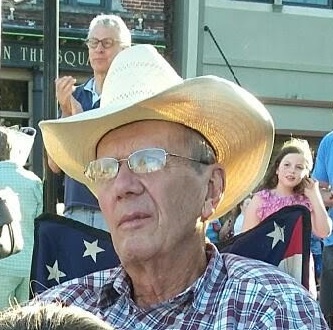 Visitation will be held from 6-8 pm, with Masonic services at 7:30 pm, on Thursday, May 3, and funeral service 11:00 am Friday, May 4, all at Park Lawn Northland Chapel, I-35 at State Route 291, Liberty. Burial will follow in Muddy Fork Cemetery, near Kearney. Memorials are suggested to Shriners' Hospitals for Children. Sending our deepest condolences. We are at a loss for words. We deeply regret that we can't be there for the services but will make sure the ponies are well taken care of. Big hugs and prayers to Kathy and the family. Kathy, I am so saddened to hear this news about your gentle Roy. Please know that you will be in our thoughts and prayers. Dear Kathy. We send our love and deepest condolences on the loss of Roy. Your memories will comfort you though this time of sorrow. We are sorry to hear of your loss of Roy. We want you to know that you and the boys are in our thoughts and prayers. Kathy and family: Graham and I send sincere condolences to you and your family. We are thinking of you during this very difficult time. May the love and support of family and friends help in the days ahead. Dear Kathy, James, Shawn and family. I am sorry to hear that you have lost Roy. My thoughts and prayers are with you during this difficult time. He will be missed.